Hop on over to The Bumbles for more. Well, a few weeks ago I wrote a post about my favorite summer movies (here) so it seems silly to make another list. I think I’ll make a list of summer movies that I’ve never seen but have always thought I should. Vote for which one I should watch first and I’ll watch it in the next week or so. So tell me, which one of these movies have I been missing out on the most? One vote please! I’ll see what the count is over the weekend. After looking at what I watched this year Bridesmaids (2011) was easily my favorite. It wasn’t perfect, but it was funny. I am not a Kristen Wiig fan, on SNL her characters usually annoy me, but she did win me over in this one. The humor is raunchy and over-the-top, but somehow I really felt for Wiig’s character. Melissa McCarthy was so great in this film. I’ve loved her since she was Sookie on Gilmore Girls. For those that have seen the movie, Air Marshal John (Ben Falcone) is Melissa’s real-life husband. So, what has been the best movie you’ve seen so far this year? necessarily the focus of the film…Share on your blog movies that turned the heat on their characters and link back here, The Bumbles. Of course, the first one that comes to mind is Body Heat (1981). Kathleen Turner and William Hurt were smokin’ hot! The next obvious choice is the Seven Year Itch (1955). Even if you haven’t seen this movie that takes place one hot summer you are probably familiar with iconic Marilyn Monroe scene. Holes (2003) is very hot. How hot would you be digging holes all day in the desert? So, what’s another movie that sizzles? Well, I tend to forget confusing movies fairly quickly. Jason and I discuss it after we’ve watched it and if we can’t reach some sort of conclusion I usually just write it off as a bad movie 🙂 But here are a few I remember being confused by. 1. Donnie Darko (2001) was a movie that just made me feel stupid. At least until after I’d watched it and then looked online for some answers and realized that the writers were confused themselves. If you enjoyed it, great, but don’t think that you ‘got it’. I actually liked the movie, but I do not pretend to completely understand it. 2. 2001:A Space Odyssey (1968) I wanted to like it, but ended up being confused as to how such a strange film in considered a classic. Maybe it was all of the ‘special effects’ that did it in for me. Or the last scenes. Well, okay, maybe all of it. 3. The Matrix Revolutions (2003). I really liked the first one. Thought the second one was okay. But this wrap up of the trilogy lost me. Jason tried to explain it to me but it hurt my head. 4. Muholland Drive (2001) I remember I really liked this one, except by the end I had no idea what had just happened. Frustrating, but the movie experience was still good. Now that I’ve read some theories on the movie I want to go back and watch! 5. Planet of the Apes (2001). It had been years since I saw the original, so maybe it’s not surprising that I felt confused by then end of this one. And then cheated. Jason rewatched it on tv, but I really didn’t want to waste any more of my time. Looks like 2001 was a confusing year for me. Is there a movie that has always confused you? Am I alone in my choices? presented. And please visit The Bumbles to participate. I’ve only got a few minutes before heading out-of-town, but here are the few I’ve come up with. 1. In No Way Out (1987) Kevin Costner is stuck in the Pentagon while he is assigned the task of finding his lover’s killer. Only the trail points to him unless he can prove that Gene Hackman gave her a government registered gift from Morocco, thus pointing a finger on him. I love this thriller. 2. The Breakfast Club (1985) is an all-time favorite and who doesn’t love the scene when good girl Molly Ringwald gives bad boy Judd Nelson a diamond earring? 3. Colin Firth’s gift of a diary to Renee Zellweger in Bridget Jones’s Diary (2001) made a very fun and satisfying last scene. Do you have a favorite gift in film? 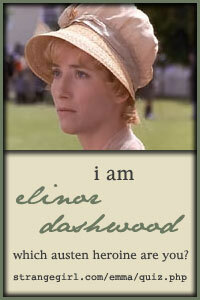 …The movies like to pay tribute to writers as well. After all, without them we’d be hard up for a good flick. Here are some writers in film that we came up with. Share on your blog movies that feature writers, authors, poets and scribes, linking back here so that others can find you. There are so many to choose from but these four classics are favorites of mine and they all feature a writer, so I’ll go with these. Yes, I know, these movies make it onto my Monday lists often. So, why haven’t you seen them yet?! 1. Macaulay Connor in The Philapelphia Story James Stewart was the underdog author/reporter that you were rooting for to win the girl. Except you wouldn’t really be upset if she ended up with Cary Grant. It was a win-win for Katherine Hepburn’s character, Tracy Lord. 3. Joe Bradley in Roman Holiday (1953) Gregory Peck has the story of his life land in his lap and as a reporter in Rome it’s hard to resist the girl, especially when she’s Audrey Hepburn. Again, a writer easy on the eyes. 4. Peter Warne in It Happened One Night (1934) Clark Gable is a reporter following a story and the story happens to be Claudette Colbert. Another handsome writer. I’m sensing a theme here. I could try to come up with another, but Gage thinks I need to be done. So, is there a classic movie that I missed featuring a writer. Do tell. And please visit The Bumbles to participate. Movies have featured farms and farming forever. Their roles in film have changed and even diminished some as the industry of farming has waned. But there are plenty of examples out there. Here are a few that we thought of. Share on your blog movies that are set on a farm, focus on farmers or reference farming in some way, linking back here so that others can find you. 1. Children of the Corn (1984) was a hit at slumber parties when it came out. If only to see who would hide in their sleeping bag, who would scream, and who would pretend it wasn’t the creapiest movie ever. 2. Grapes of Wrath (1940) is a the serious side of what happened to farmers during the Great Depression. A downer of an awesome movie. 3. 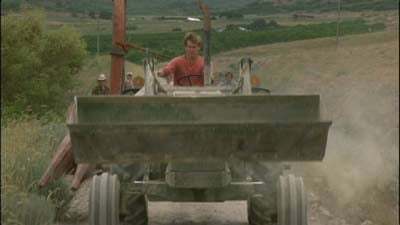 Footloose (1984) isn’t necessarily a farming movie, but the scene where they play chicken with the tractors is one that came to mind. 4. Man in the Moon (1991) is a surprisingly good movie. See it to check out a young Reese Witherspoon. 5. Signs (2002) is a good one. Who was doing all that damage to the fields? The answer may surprise you (or not). This was before Mel Gibson became taboo. So, what farming movie would you recommend? Please contribute your thoughts to my 5 word movie reviews for charity. Post here. So far, we’re up to $66. beautiful town on the Connecticut Shore, its most famous resident was none other than the impressive Katharine Hepburn. She and her family lived there throughout her life and it is where she died. A new theatre was dedicated to her memory and bears her name there. So what other possible topic could there be for this week other than the winningest Best Actress herself? Here is our favorite Hepburn film. Share on your blog your favorite moments, memories or films featuring Katharine, linking back here so that others can find you. Monday Movie Meme is found at The Bumbles. It is no secret that I love Katherine Hepburn. I was really surprised as I prepared to write this post to see that she had been in 51 movies (including tv movies) and I have only seen 10. How can I call myself a fan if I’ve seen so few of her movies? Well, I am going to remedy that, so expect to see more of Katherine in my 5 word movie reviews! Kate is always smart and commanding and it was surprising to see that she was only 5’7 1/2″. Her onscreen presence, and maybe her thinness, made her appear taller. Here are the 10 movies of hers that I’ve seen in the order that I love them. 1. The Philadelphia Story (1940) is my favorite movie ever not just because Katherine is in it. Love her chemistry with both Cary Grant and Jimmy Stewart. Here’s my post raving about the movie. 2. The African Queen (1951) is another favorite of mine. Kate plays a missionary and Humphrey Bogart a drunken boat captain in this WWI trip on the water. 3. Desk Set (1957) is probably an odd choice for third, but I did just see it and loved that she was a librarian named Bunny. Seriously, have you ever met a librarian named Bunny? It was one of her pairings with longtime love Spencer Tracy. 4. Bringing Up Baby ( 1938) is a zany comedy with Cary Grant . This is also on my favorite list. 6. The Lion in Winter (1968) is one that I’ve seen just recently and I loved it. She starred with Peter O’Toole (Anthony Hopkins was her son) and this is one crazy family. I want to see it again already. 7. Summertime (1955) is one I could watch again and again because it shows the beauty of Venice. One of these days I’ll convince Jason we need to go back. She looked beautiful in this one. 8. Guess Who’s Coming to Dinner (1967). She and Spencer Tracy play the parents of a daughter who brings home her black boyfriend (Sidney Poitier). I liked it but it was a little too talky for me to love, but this is one of her best known movies. 9. Sylvia Scarlett (1935). Katherine disguises herself as Sylvester in this fun movie. It’s been years since I’ve seen it, but I remember thinking Kate was great. It also stars Cary Grant so you can’t go wrong there. 10. Love Affair (1994) was one of her last films and a remake of two old movies (Love Affair and An Affair to Remember). Kate as Aunt Ginny was the only part I really liked of this movie. So, what’s your favorite Katherine Hepburn movie? Three of these movies are on my 5 Word Movie Review list and you can contribute to charity just by adding your two cents 🙂 Post here. Flight is something humans have been fascinated with for a long time. The movies are filled with flying dreams and realities. Here are a few examples we came up with. Share on your blog films focused on flight, things that fly or become airborne, linking back here so that others can find you. Visit the Bumbles for other participants. Well, there are so many movies so I thought I’d go exclusively with planes. 1. The first one that comes to mind is, of course, Airplane (1980). It’s been too long since I saw this comedy in the air and I should remedy that. Johnny: Oh, it’s a big pretty white plane with red stripes, curtains in the windows and wheels and it looks like a big Tylenol. 2. As unromantic as I find Adam Sandler, I fall for him every time I see this scene from The Wedding Singer (1998). 3. Harry and Sally meet on a plane years after losing touch in When Harry Met Sally (1989), but this is a quote that stuck with me. 4. What happens after the flight ceases to fly? Well , you may end up eating things you would never have considered before. Alive (1993) is all the more scary since it is based on the true story of a 1972 crash. 5. And for my last airplane movie I’m going with a Tom Cruise movie all about flying, Top Gun (1986). Maverick, Goose: …the need for speed! For all of you movie lovers I hope you’ll check out this post about writing a 5 word movie review for charity. So far I’m up to $38.